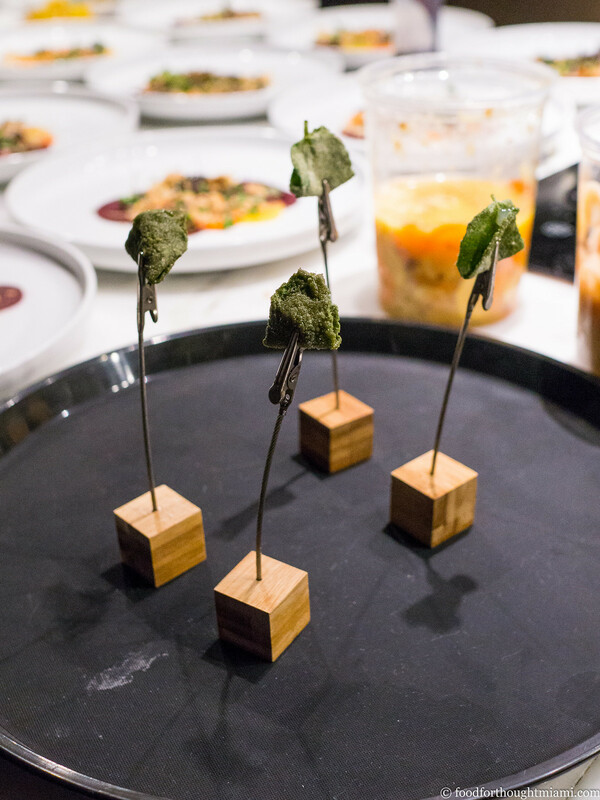 When we first started doing these Cobaya dinners, we saw it as, among other things, an opportunity to give fledgling young chefs an opportunity to test out their skills. 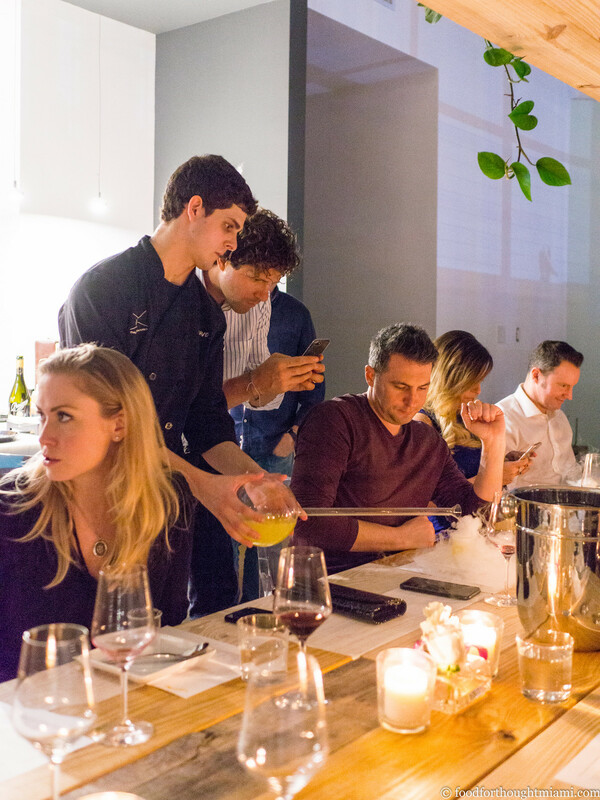 So our most recent event, Experiment #68, felt something like a return to our roots: a small group (only 18 diners), a couple young chefs (only 19 years old! 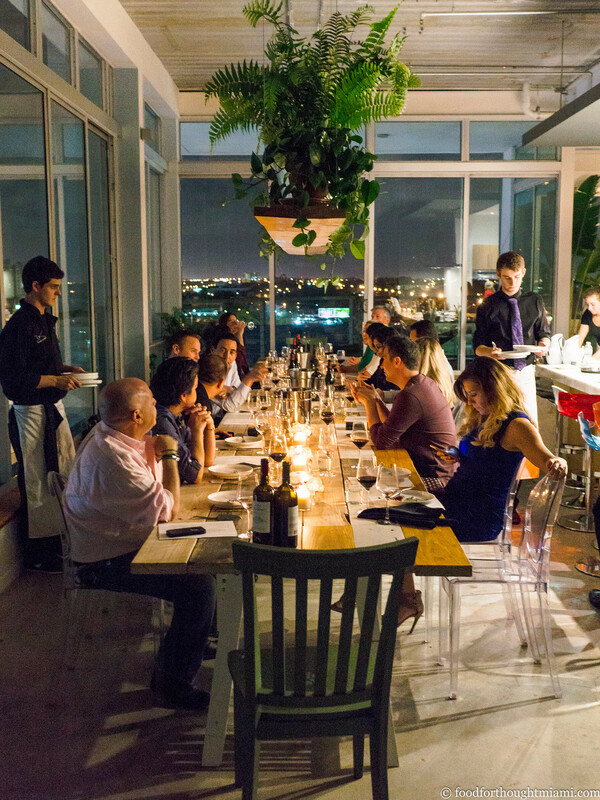 ), outside of a restaurant (in a beautiful loft space overlooking the Biscayne Boulevard MiMo District, generously lent to us by Pietro Morelli, who also runs Made In Italy Gourmet in Wynwood). 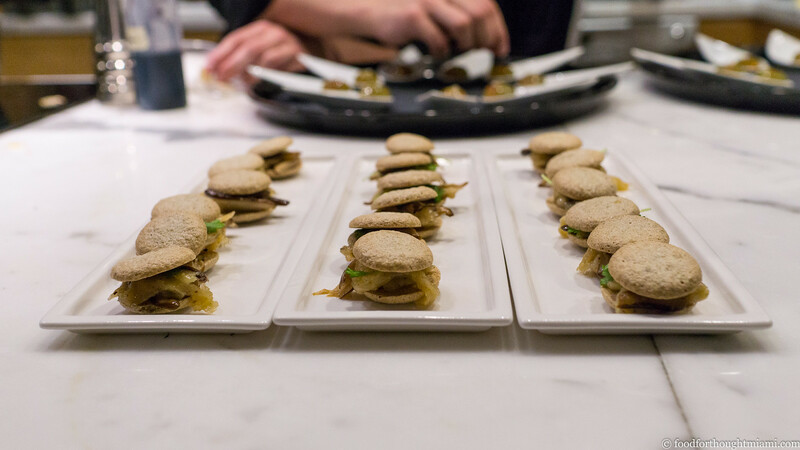 The chefs were David Lanster and Kelly Moran, who first started doing "pop-up" dinners for family and friends when they were in high school to raise money for the Common Threads charity. They're now sophomores in college. To put that in perspective, when we first started doing these Cobaya dinners, David and Kelly were about eleven years old. 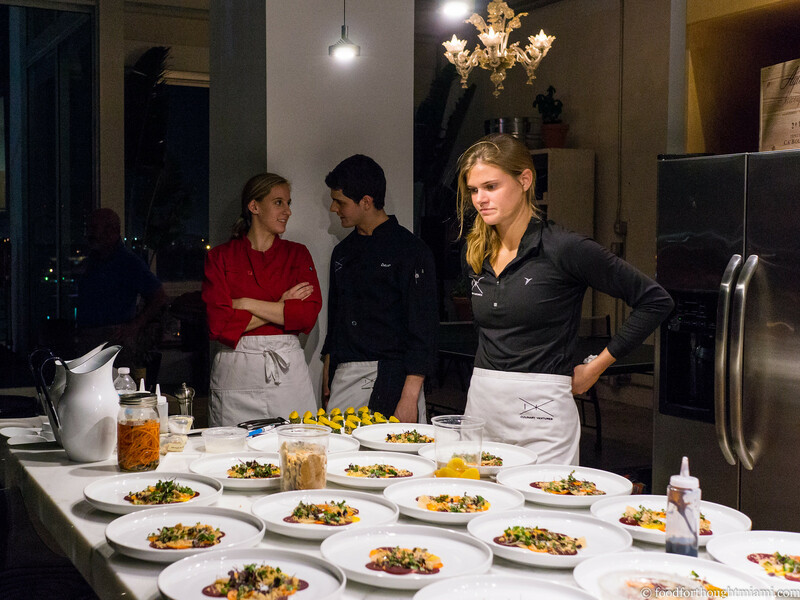 David's interests lie in the scientific aspects of cooking, while Kelly is the baker and pastry chef of the pair. 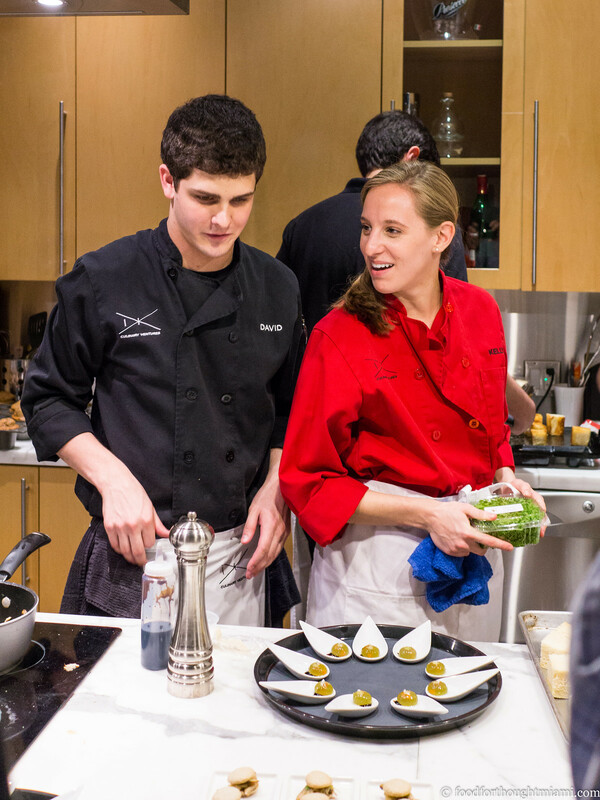 But they're not diving into the culinary world with both feet quite yet: Kelly is studying at Tufts, while David is at University of Miami. 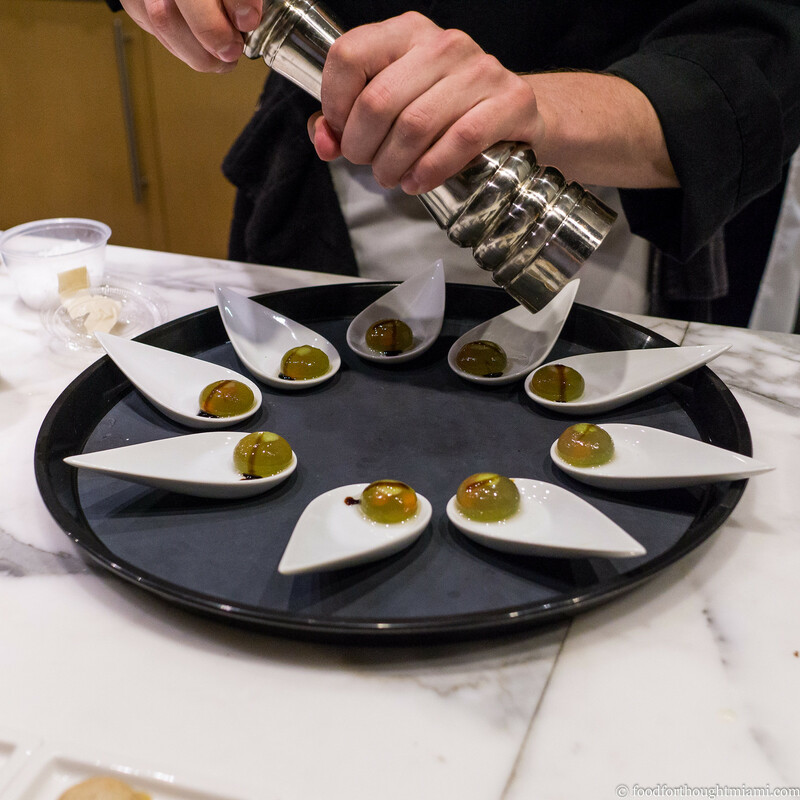 So while DK Culinary Ventures is on something of a hiatus, David and Karen – with assistance from friends and former classmates – turned out an ambitious, fourteen-course dinner for us during their winter break. (You can see all my pictures from the dinner in this Cobaya DK with David Lanster and Kelly Moran flickr set). The meal started with a series of snacks: a "house salad" which used Ferran Adrià's spherification technique to suspend bits of tomato and carrot in an orb of lettuce juice, dressed with dashes of olive oil, balsamic vinegar and sea salt; savory pumpkin seed macarons sandwiching sautéed mushrooms, brie and celery leaves; a one-bite mojito cocktail assembled from a candied mint leaf flavored with citric acid and a rum gel; and savory, green-hued sunflower cakes topped with mandarin orange segments and chia seeds, visually mimicking their main ingredient. A root vegetable antipasto salad was a beautiful presentation that made good use of vacuum compression, infusing each of the thinly sliced vegetables with a different flavor: the red beets with red wine, the golden beets with white wine, the parsnip with apple juice and ginger, the carrots with orange and caraway seed. 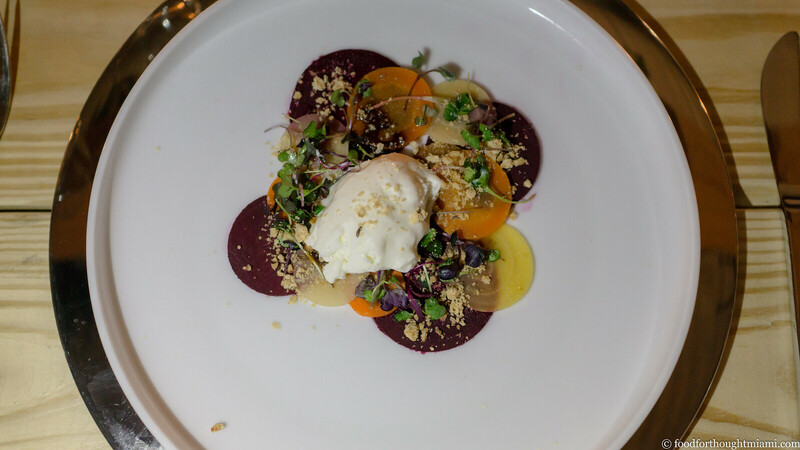 They were then topped with a goat cheese gelato (yup, beets and goat cheese), and a crunchy rye bread crumble. 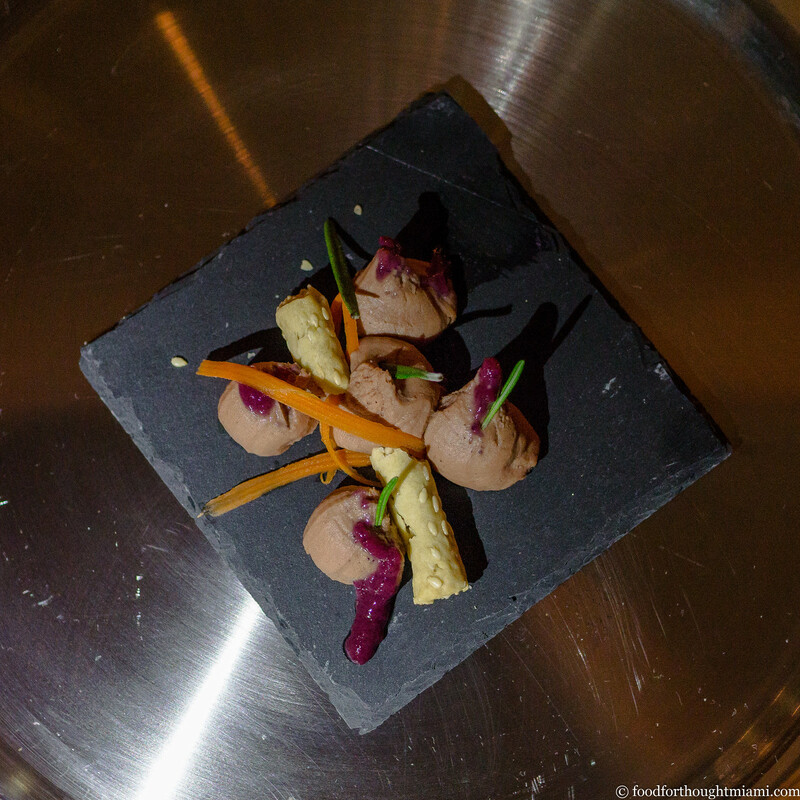 Creamy chicken liver mousse was served with a berry jelly for a sweet complement and slivered pickled carrots for tart contrast, and some sesame sticks for scooping (though I found the crusty bread that was served alongside an even better vehicle). 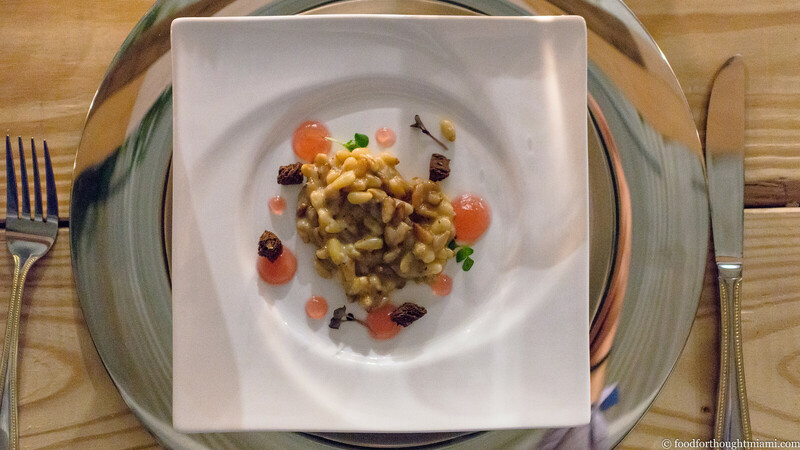 Next was a dish they first prepared for a "Modern Taste of Italy" charity lunch at a local Italian restaurant: a rice-less "risotto" of pine nuts, slowly braised so the nuts soften and become bound in a creamy blend of their starches and their braising liquid. 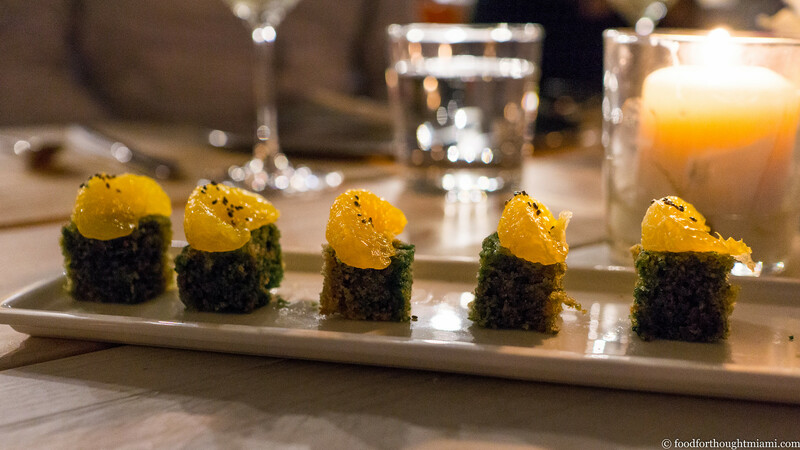 It was served with a "Youthberry" gel, pumpernickel crumbles and fresh basil. "Pulled Pork in Cubism" required some explanation. David spent a high school summer traveling to baseball tournaments throughout Florida and Georgia, and sampling barbecue along the way; the summer wound up with a visit to modern art museums in New York City. 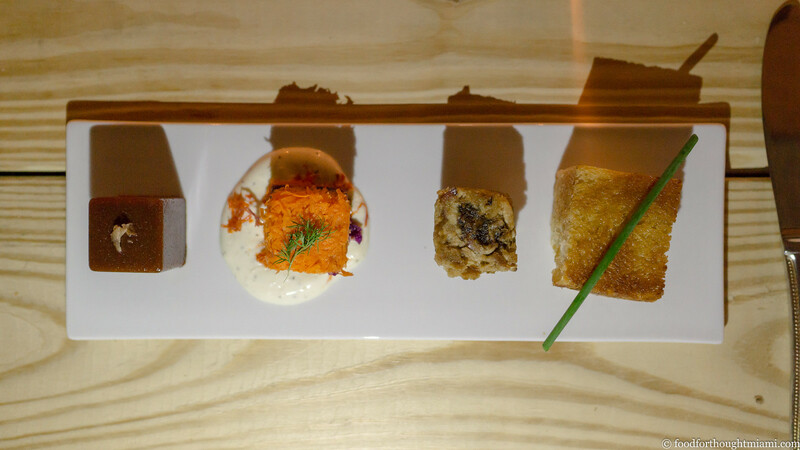 So this dish took the flavors of Southern BBQ and put them in the format of cubism: from right to left, a block of pullman Texas toast, a cube of smoked, molasses glazed pulled pork, a cole slaw "terrine," and a cube of BBQ sauce gel with smoked salt. Put them back together and you have a darn good pulled pork sandwich. 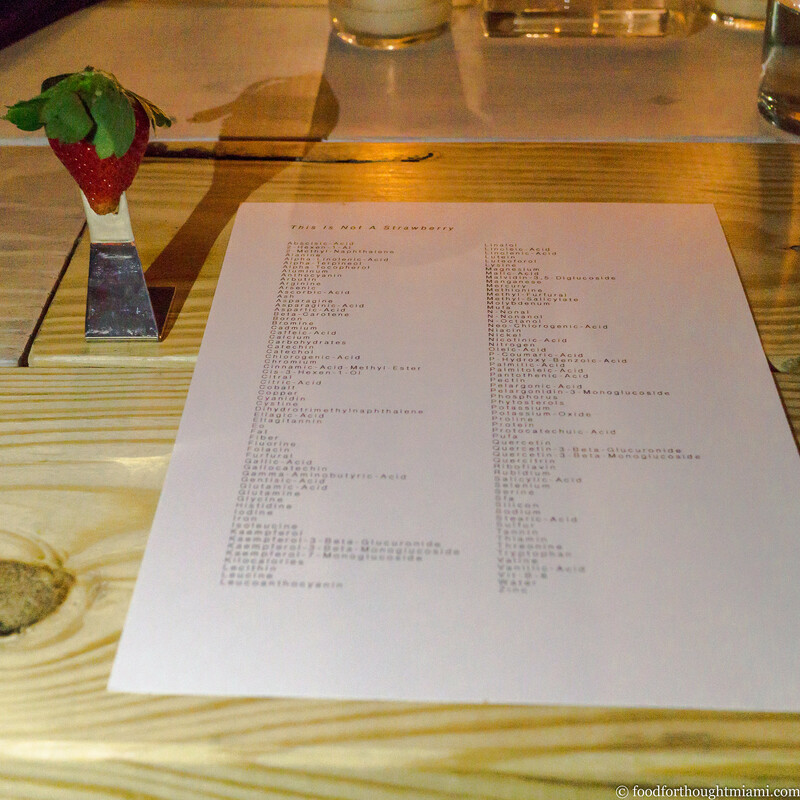 Another little ode to modernism both artistic and culinary: "This Is Not a Strawberry"featured first a sheet of paper with a list of the organic compounds found in a strawberry, and then ... a strawberry. 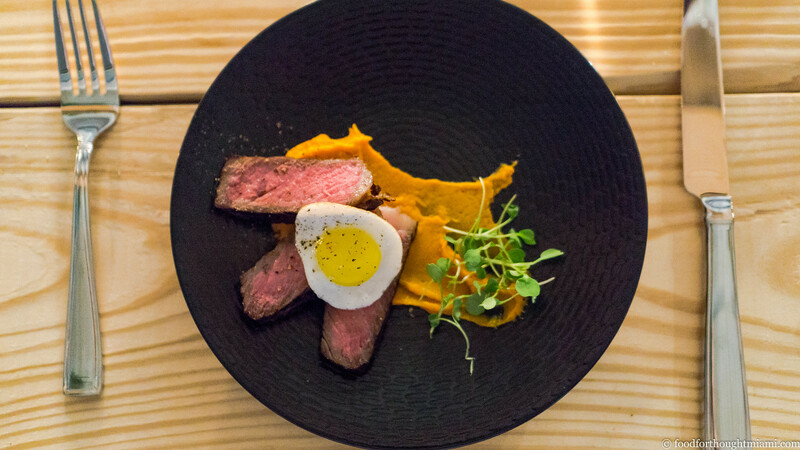 For a version of steak and eggs, we had a "twice fried" strip steak – uniformly rosy in the middle, a uniform layer of sear around the edges – paired with a shmear of a smoked carrot purée and a fried quail egg. 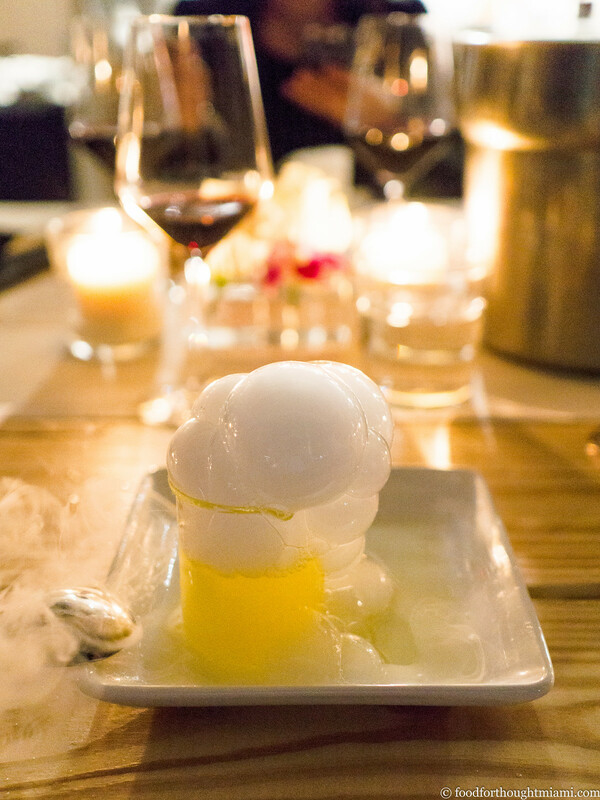 Our first dessert featured a little show, with an old science fair trick brought to the dinner table: a pineapple juice concoction poured over dry ice at the table to make "pineapple bubbles" (or, as Steve BM dubbed them, "pineapple farts") which you could capture on your spoon. Next, sounding a more traditional note, a puddle of oozy, creamy Harbison cheese from Vermont's Jasper Hill Farms, matched up with a spiced, red wine poached pair, a tart fresh blueberry, and some micro-greens. 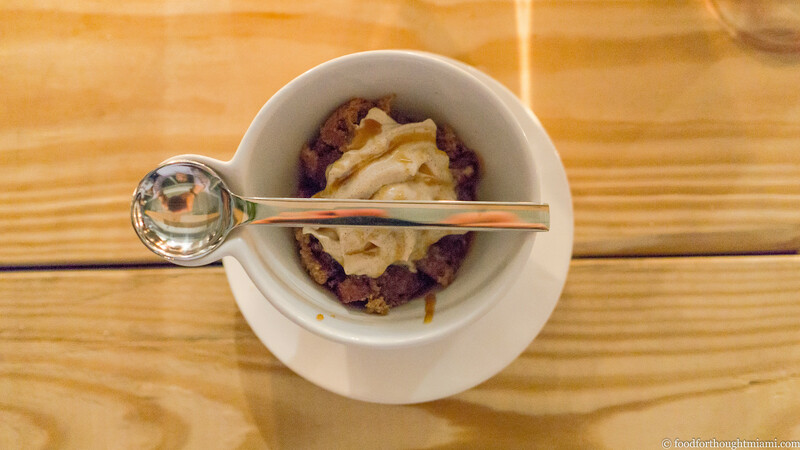 Next, a sort of bread pudding of moist, fruity date cake, topped with toffee sauce and maple cinnamon whipped cream, bringing together all the flavors of a classic English sticky toffee pudding. 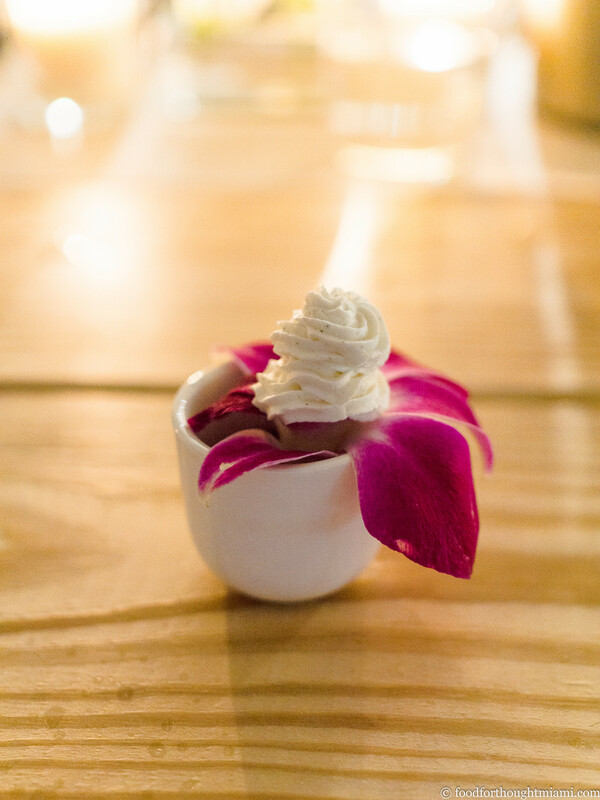 And for a final sendoff, a little Alinea-inspired touch featuring the centerpieces which had been on the table the whole evening: an edible orchid as the vehicle for a vanilla and rooibos infused mousse, nestled atop a small cup of rooibos tea. 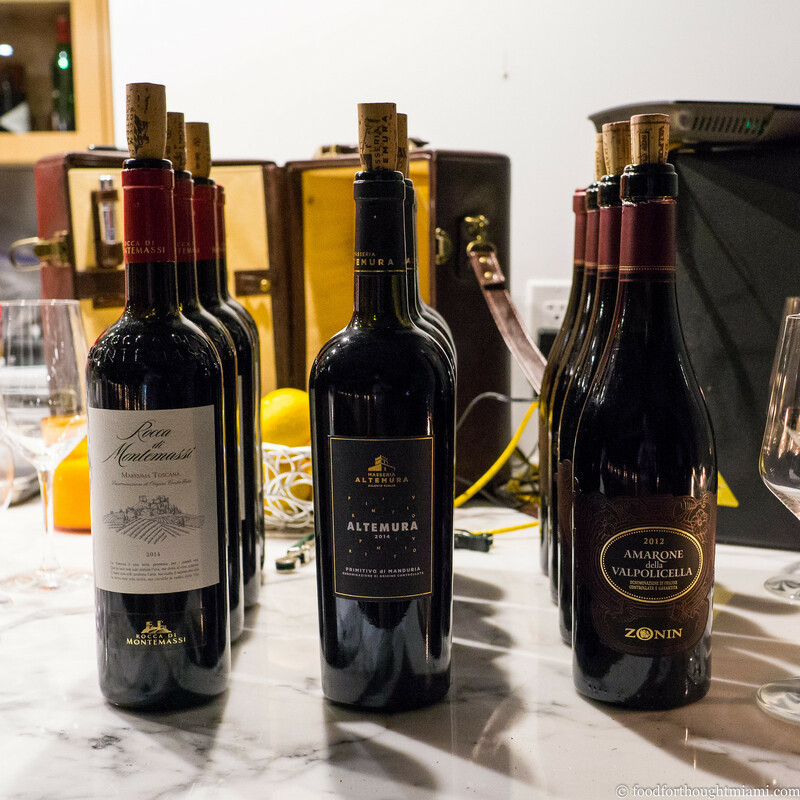 Though I don't think anyone in the kitchen was old enough to drink, we were fortunate to have Paolo Dal Gallo (a/k/a "80's Rock Star," according to our host Pietro) from Zonin Wines to supply the pairings for the evening. starting with a bubbly Prosecco, a bright, high-acid Sauvignon Blanc, the Rocca di Montemassi "Super Tuscan," a chewy, ripe Primitivo from Altermura, the intense Zonin Amarone di Valpolicella. and a Vin Santo to finish. A special word of thanks is due also to Pietro Morelli, who graciously lent us his gorgeous loft space atop the Bank of America building at the corner of Biscayne Boulevard and NE 81st Street. With its long table surrounded by windows overlooking the MiMo District, it was a perfect location for our dinner and I hope he finds other opportunities to host events there. 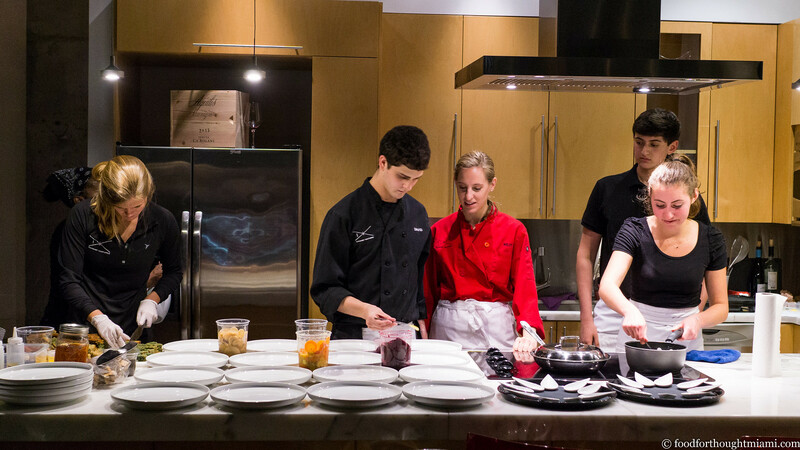 I was impressed not just by the ambition and interest these young kids have in the cooking world, but also their organization. 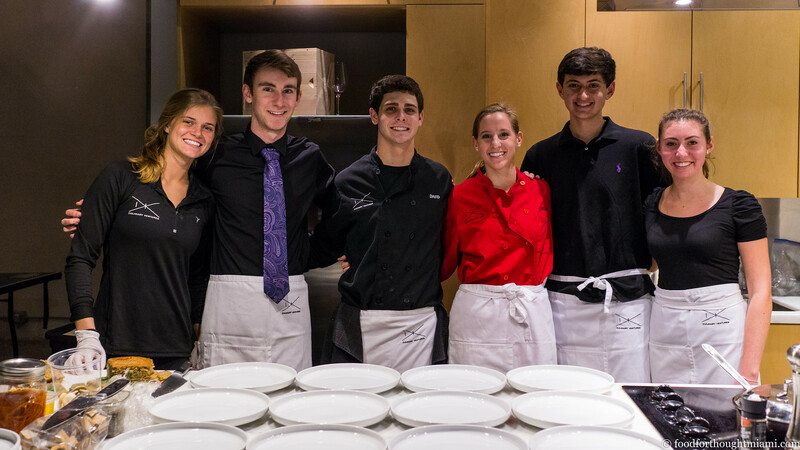 It is no mean feat to turn out fourteen courses for eighteen people out of a residential kitchen, but they did so efficiently and smoothly. 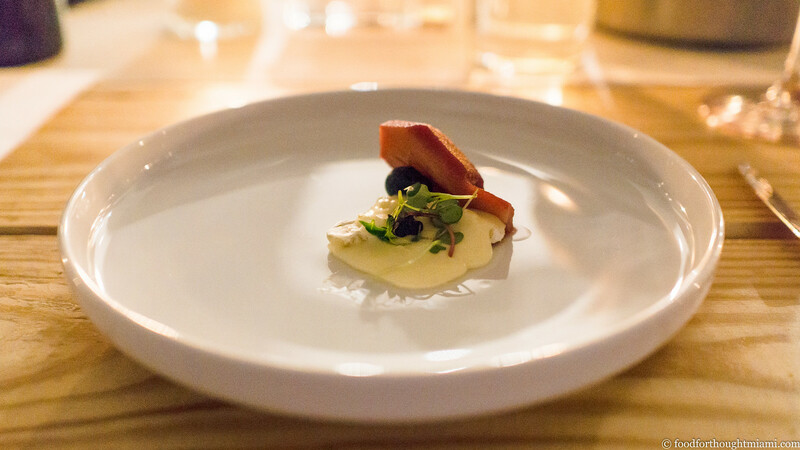 It's a long path from a small pop-up dinner to a restaurant kitchen, but should David and Kelly pursue it, they're on the right path. 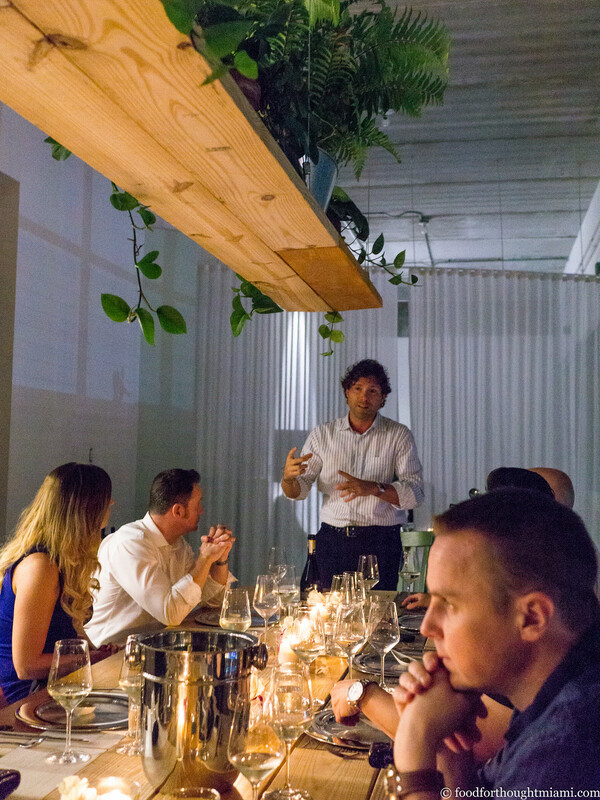 A big thank you to Kelly and David, to all their crew, to Pietro for the great space and Paolo for the great wines, and as always most of all, to the guinea pigs whose support makes these kinds of events possible. Being an old fart, I had no idea what "Youthberry" is. Turns out it's a Teavana tea blend that includes red currants, açai berry, hibiscus and rose petals – a millennial Red Zinger, I suppose. I'm more than twice their age, I'm allowed to call them "kids."